Újpest (the fourth district of Budapest) lies on the left bank of the Danube, in the northern part of Pest. Area: 18.8 km2. Number of inhabitants: 110,000. Újpest had been an independent village at the northern gate of the capital of Hungary for 114 years. The designation 'Újpest' was first laid down in printing in 1838. The deed of endowment of the independent village was issued by count István Károlyi in 1840. 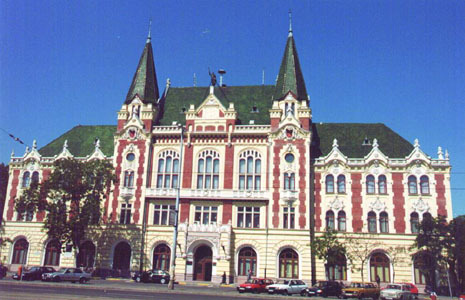 By 1870 Újpest became a village with the largest population in Hungary (10,000 inhabitants), with significant industry. In 1907 the village was granted the privileges of a town with "organized council", its first mayor was dr. Gyula Ugró. The town received the title 'town of county rank' snd it was annexed to Budapest on January 1st, 1950. The district once famous for its leather, wood, textile and chemical industry is currently the seat of several significant companies (e.g. Tungsram, Chinoin). Outstanding artists of literature of the district include the poet Mihály Babits and the writer Margit Kaffka who also taught here. Poet József Berda lived and worked in Újpest, too. Architectural sights include the Water Tower and the Town Hall. Újpest also has a collection of local history, a theatre and a gallery.